2011 was quite a year for Fighting Illini sports, both good and bad. As I type this, the football team, captained by interim coach Vic Koenning is winning their bowl game against UCLA in San Francisco, while the basketball team got pummeled at Purdue at around the same time. (More on both of those games later). But, the football program endured its share of ups and downs during the season, and the fact that they are even in a bowl game is a miracle unto itself. After all, this is the same team that started the season 6-0, lost their next 6 games to finish the regular season 6-6, and in the process, fired head coach Ron Zook. That firing led to the naming of Koenning as interim coach, and for the exception of defensive line coach Keith Gilmore, will start fresh with a stable of new coaches under Tim Beckman, who was hired in mid-December to take over the Illini. Koenning, who is headed to North Carolina to become defensive coordinator for Larry Fedora, has done a pretty good job leading the Illini in the meantime, and I must admit that I will be sorry to see him go. But, I understand his reasoning to want to start fresh, especially when there is a new coach coming in from the outside that has his own schemes. This Illini team, who ended up defeating the Bruins 20-14 in the Kraft Fight Hunger Bowl, is the first team in school history to win consecutive bowl games, and with a long standing history of Illinois football, that is remarkable in itself. Granted, when you think Illinois football, winning is not something that immediately comes to mind. But, that is still a feat that warrants mention. This hasn't been the best Illinois team by far, but under Koenning, at least they gave it all they had. Beckman inherits an Illini team in much better shape than when Zook was named coach after Ron Turner was fired. The only impending question at the moment is whether or not junior defensive lineman Whitney Mercilus will return. Mercilus had a record setting season, and all signs are pointing to him skipping his senior season and taking his game to the next level. 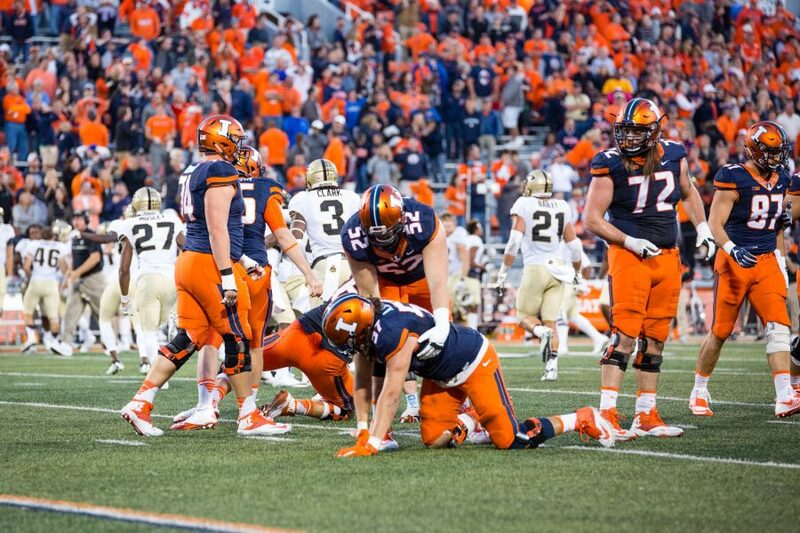 All in all, a nice bowl win by the Illini and something to build on as the Tim Beckman era begins in Champaign. Bruce Weber's Fighting Illini men's basketball team also played on New Year's Eve, and at the same time that the football team was doing battle in San Francisco. The result was not as favorable, however, as the Illini dropped a 75-60 decision to the Purdue Boilermakers at Mackey Arena in West Lafayette. The Illini have not beaten the Boilers in the last 6 games, which means that nobody on the current squad has tasted victory against them. 2011 was another year of ups and downs for the Illini basketball team, with a return to the NCAA Tournament, and a win against UNLV before losing to Kansas and former coach Bill Self in the third round. Key losses of Demetri McCamey, Mike Davis, Mike Tisdale and Bill Cole to graduation, as well as Jereme Richmond declaring early for the NBA draft. The story of Richmond didn't end very well, as he was not drafted, and ended up getting arrested and could face possible prison time as a result of his misfortunes. Such a tragic turn of events for a promising talent that may have seen his career end before it even began. Nice way to waste four years waiting for him to arrive, and then to have this happen. The defections didn't end with Richmond, however, as earlier last week Crandall Head left the Illinois program, apparently for a lack of playing time. Crandall had his problems while at Illinois, and unlike his brother Luther, who was given a second chance by Weber, never could seem to be consistent on the court. However, this is still a young Illinois team, and this year could be packed with a lot of nights when they play like they did against Purdue. I would just get used to it, and if I were Mike Thomas, maybe it is time to think about a change at the top if things continue on the path that it is at the moment. The Big Ten is competitive, and wins on the road will be hard to come by, no matter who you are. Perhaps the highlight of 2011 was the remarkable run by the Fighting Illini women's volleyball team, as they made it all the way to the national championship game, before falling to UCLA, who won their fourth title in their storied history. Kevin Hambly had his team set a goal at the beginning of the season, and that goal was to win the title, something that they nearly accomplished. There were a few bumps along the way, but for the most part, the season went according to planned, and was a magical run. Hopefully the ladies can repeat the feat in 2o12 and create some sort of a dynasty for the Illinois program. That is sorely needed in any sport at the moment. Jolette Law's Illini women's team continues Big Ten play this coming week when they welcome Purdue to the Assembly Hall on Monday to begin 2012. 2011 saw some flashes of promise, as the Illini ladies made a run in the Big Ten Tournament in Indianapolis, finally bowing out to Penn State in the semifinals. The loss meant the the Illini have not been to the NCAA Tournament in 8 years, something that drastically needs to change. So far in the 2011-12 campaign, that streak seems in no danger of ending, as they have stumbled out to a 6-8 start to the season, albeit losing Centrese McGee before the season began to an ACL injury. I also hope that Mike Thomas is closely watching this situation and makes the right decision about the future of this program. Happy New Year! May 2012 bring more promise!! Last Friday, Tim Beckman was introduced as the 23rd head football coach at the University of Illinois, replacing Ron Zook, who was fired late last month. Beckman comes to Illinois from the University of Toledo, where he compiled a 23-16 record over the past 3 seasons, including a 14-2 record in the Mid-American Conference (MAC). There has been an awfully lot of conversation since Beckman was hired, and a good deal of that chatter has not been on the positive side. There are certainly a lot of questions that need to be addressed with this hire, but a couple really stand out above the others. The first question is whether or not this was the correct hire for the University and moving its football program forward. I have mentioned before that Zook left the program much better than he inherited it, and a lot of that is based on his ability to recruit and bring in some of the higher caliber players. Can Beckman carry on that tradtion? A lot of the bigger, more trusted names either were not interested in the job, or were lured away by other schools that have deeper pockets to pay the head coach. Athletic Director Mike Thomas, himself well-known for hiring MAC coaches where he previously was at the University of Cincinnati, is sure that he has hired the right guy for the job. At his introductory press conference when he was introduced, Beckman gave a speech that would lead to believe that he is ready for the job. The second, and perhaps more important question that the Beckman hire raises is the fate of the current coaching staff and what lies in store for them as the new staff is formed. Interim coach Vic Koenning, who also serves as the defensive coordinator, remains on the staff, but it is unclear as to whether or not he will stay on once Beckman begins to formulate his staff. On Monday, Beckman extended an invitation for Koenning to stay in a co-coordinator role, and then on Tuesday, modified that invitation to the full coordinator spot. Beckman gave Koenning until Wednesday to make up his mind, but rumors have been circulating about Koenning being offered defensive coordinator positions elsewhere that would undoubtedly be worth more money than what Illinois would be willing to pay. The reversal of fortune tells me that Beckman intends to bring in his own man on defense, and who knows how much input Koenning would have. Granted, Koenning has a lot to think about in making this very important decision, as well as trying to get a football team ready to play in a bowl game in just over two weeks from now. Word came out out late on Tuesday that none of the offensive staff will return for next season, so it appears that the dominoes have already begun to fall. And, just announced on Wednesday, Koenning has indeed chosen to leave the program to pursue other opportunities. Koenning will stay with the team through the Kraft Fight Hunger Bowl, then leave once the bowl game is over. Defensive line coach Keith Gilmore will remain on Beckman's staff as he begins to assemble it over the next few weeks. Stay tuned for more information on this breaking news. For the first time since 1992, the Fighting Illini women's volleyball team is off to the Final Four. They punched their ticket to San Antonio by defeating Florida on their home floor last Saturday evening in an exciting 3-1 match. The match was tight from start to finish, as most regional finals are. The Illini have been one of the top teams in the nation all season long, and remain the highest seed left in the tournament. They will take on the Women of Troy, otherwise known as USC on Thursday evening at the Alamadome in San Antonio (approximately 8:00 pm, ESPN2), following the UCLA-Florida State matchup, which begins at 6:00 pm. Both matches will be televised, with the winners facing each other in the national championship game on Saturday evening. Coach Kevin Hambly has kept the distractions to a minimum all season long, and downplayed the stretch of games during the season that saw them fall from the top spot. Hambly was more concerned with being #1 when the season ended, not in the middle of it. Now, the Illini have their chance to do just that, and are two wins away from accomplishing that feat. The Fighting Illini men's basketball team has raced out to a 10-0 start to the season, their best beginning since the year after the Final Four year. The latest victories weren't easy ones, but they still count in the win column nonetheless. St. Bonaventure presented a unique challenge for the Illini, and they proceeded to triple team center Meyers Leonard, thus essentially taking him out of the game. The Illini won a hard fought 48-43 contest, one that they had to come from behind in order to win. Then, on Sunday night, the Illini hosted Coppin State, another team that didn't want to go away easy. The Illini prevailed in that one as well, 80-63, and as a result of yet another perfect week, saw them rise in the rankings to #19 in both the AP and the ESPN/USA Today Coaches' poll. Rankings mean nothing at this point of the season, and the Illini have a challenging week ahead as they try to maintain their unbeaten record and Top 25 ranking. The Illini make their annual trek to the United Center on Saturday to play UNLV (4:00 pm CT, Big Ten Network). Then, the Illini will return to the Assembly Hall on Monday evening to face the Big Red of Cornell before making their yearly trek to St. Louis to face their first top 10 team of the season against Missouri in the Busch Braggin' Rights game. The Fighting Illini women's basketball team had been idle for nearly a week since defeating Illinois State 66-56 in Normal. The Illini will also be playing at the United Center on Saturday afternoon ahead of the men when they take on the Texas Tech Red Raiders. Jolette Law's team currently has a 4-5 record on the season. I forgot how much fun trying to hire a football coach can be. In the days since Ron Zook was fired as Illini head football coach, there has been much speculation on who his replacement will be. Names have surfaced, rumors have spread, but so far, nobody has emerged as the clear-cut favorite. Sure, there have been names that made sense, but no one has made the commitment and signed on the dotted line yet. First there was Mike Leach, then Kevin Sumlin, and now the focus has shifted to Tim Beckman of Toledo. The only one that truly know what is going on is athletic director Mike Thomas, and he's not saying anything to anyone. A lot of rumors have been flying around as well about Thomas' whereabouts the past week during this search, but who know how credible this information is. One thing is clear: whoever comes into the job will need to build on what Zook started. It is fair to say that Zook left the program much better than he inherited it, but there is still a long way to go in order to make the Illinois program a consistent winner. Does anybody want this job? I begin to wonder as name after name appears to turn down the job for various reasons. Money is definitely a key issue, and I'm not sure that Illinois cannot afford another buyout of a football coach, since the state has multiple issues of their own outside of sports. With the uncertainty of who the new coach will be, it remains to be seen who of the current coaches will be on staff for the upcoming bowl game. Interim head coach Vic Koenning spoke to the media, as well as Thomas to discuss the Illini's bowl invitation, which was determined on Sunday night. The Illini were selected to play in the Kraft Fight Hunger Bowl in San Francisco, California on New Year's Eve. Their opponent will be UCLA, who also is in search of a head coach, since Rick Neuheisel was fired after the season. The Bruins are 6-7 on the season, which means that the loser of this bowl game will end the season with a losing record. Koenning really impressed me at the press conference by speaking from the heart instead of sounding like Zook has over the past few years. Koenning stated that if guys get jobs, they need to go to them, especially if they are needed for recruiting. He also expressed that he is looking, and may not even be around to coach the Illini in the bowl if he gets a job elsewhere. So much uncertainty remains, but someone will undoubtedly take the reins if Koenning cannot. One coach has already left the program, that being Paul Petrino, who rejoined his brother Bobby in Arkansas. Petrino will be the offensive coordinator and also coach quarterbacks. Petrino had some interesting comments upon leaving, and some of them could even be translated as a slam on Zook himself. So, who knows what the next three weeks will hold for the Illini football program as they practice for the bowl game. Stay tuned. The Fighting Illini men's basketball team is coming off a big win over Gonzaga that has launched them into the Top 25 for the first time this season. The Illini took down the Bulldogs 82-75 last Saturday at the Assembly Hall before a national television audience, and looked good doing so. Meyers Leonard definitely has evolved into a formidable post player, and he took full advantage of going up against Gonzaga's big man Robert Sacre. The main question was whether or not the Illini could sustain that momentum coming off the big win into their next game, which was also at home against St. Bonaventure. Based on the way this game went, I would say that the Illini failed the test. The Bonnies were a dangerous team coming in, as the Illini found out early. St. Bonaventure shut down the inside game of the Illini, forcing them to rely on the long range jumper. The Bonnies had a nine point lead with five minutes to play, and the situation looked very bleak for the Illini. Then, Brandon Paul showed up and willed his team to one of the more improbable comebacks in recent memory, resulting in a gutty, 48-43 victory. Paul finished the game with 17 points, including several key shots down the stretch. When nobody else would venture inside the lane, Paul dared to try, and gave the Illini the spark they needed. The win over the Bonnies keeps the Illini in the rankings for at least one more week, and gives them a record of 9-0, their best start to a season since the 2005-06 season. The Illini are in final exam mode right now, but get back into action on Sunday night when they welcome the Coppin State Eagles to the Assembly Hall (7:00 pm CT, ESPNU). Coppin State is 3-4 on the season, but as the football team found out, you don't overlook anyone, especially when you are unbeaten. Kevin Hambly's Fighting Illini women's volleyball team passed its first postseason test last weekend at Huff Hall, downing both Central Michigan and Marquette 3 games to none. The Illini, who garnered the overall #3 seed in the NCAA tournament, now will head to Gainesville, Florida to play in the regional with Florida, Ohio State and Michigan. The Illini will face the Buckeyes for the third time this season, with the Illini winning both matches during the regular season. The Illini defeated the Buckeyes in straight sets in Columbus, while taking them down in 4 games in Champaign. This is also the third time that the Illini and the Buckeyes have met in the NCAA Tournament, the last time in the first round at Huff Hall back in 1992. The Illini will play at 4:00 pm CT on Friday, with the winner facing the winner of the Michigan-Florida match at 6:00 pm CT on Saturday. The Friday matches will be streamed on espn3.com, with the final being on ESPNU on Saturday evening. After losing 5 of the their first 8 games of the season, Jolette Law's women's basketball team is on a two-game winning streak, the latest being a 66-56 win over Illinois State in Normal on Wednesday evening. Freshman Ivory Crawford netted a career high 16 points to lead the Illini to the victory. The women have been away from the Assembly Hall for quite a while, and that hiatus will continue, at least for the next couple weeks. The next game for the women takes place next Saturday (December 17), when they battle Texas Tech at the United Center (1:00 PM, CT, BTN). That game is the front end of a men's and women's doubleheader the week before the Christmas holiday.